If you are wondering WTH is going on read this post. Your best kept secret: Now, if I share it with you, then it's not my best kept secret anymore?! OK, seriously, I'm a machine when I put my mind to getting something done. It's a little scary. I become obsessed with getting a task done and have trouble focusing outside of that. A romantic comedy movie that best describes your life: This one is very hard to answer and after thinking for a couple of days, I still have no answer. However, my favorite romantic comedy of all time is Four Weddings and a Funeral. I big puffy ♥ Hugh Grant. Celebrity parent you'd trade places with and why: Victoria Beckham. Except, I would actually eat. She has fab clothes, homes in the States and London, and that amazingly gorgeous Brit hubby. Yeah, I think I could deal with that. 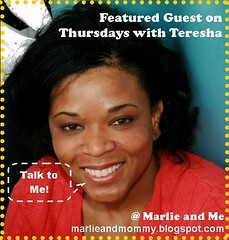 Next week on Thursdays with Teresha...parents who blog when they should be exercising. Just kidding! Look out for a new set of questions answered by yours truly and Angie's pick for the next featured guest. I totally looked behind to see if you were watching me when you wrote "parents who blog when they should be exercising". Great post!! Stopping over from SITS. Hope you have a good weekend. how fun! I would have no idea what romantic comedy I would be... good question! I'll have to come back and tell ya what I come up with! Hey fellow SITSta! Thanks for stopping by my blog.